Flemish artist who entered the Guild of Painters in Bruges in 1519, and also worked as an architect and designed sculpture, tapestries, and pageant decorations. 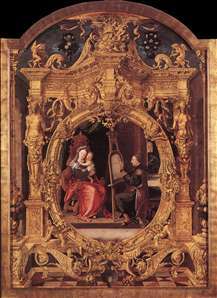 In 1550 he and Jan van Scorel were commissioned to restore the van Eycks celebrated Ghent Altarpiece. The triptych of The martyrdom of SS. Cosmas and Damian (S. Jacques, Bruges) is typical of his work as a painter in its profusion of Italian ornament. By the 16th century Bruges had declined greatly in importance as a trading centre as its port silted up, and Blondeel represents one of the last sparks of its great artistic tradition. See more details about "St Luke Painting the Virgin's Portrait"